, an English divine of considerable abilities in controversy, was educated at Trinity-college, Cambridge, but of his early history we have no account. In 1586, he was installed archdeacon of Taunton, and on Oct. 22, 1588, confirmed dean of Exeter. He had been admitted a civilian in 1582. He died in 162U, leaving a daughter his heiress, who, Prince thinks, was married to the son and heir of the Halse family in Devonshire; and as the estates Dr. Sutcliffe left to Chelsea-college were in that country, it probably was his birth-place. He was esteemed a very learned writer | in defence of the protestant establishment; but although long in favour with James I. upon that account, we find that this prince, in 1621, ordered him to be taken into custody for the freedom of his remarks upon public affairs. On the other hand Strype, in his life of Whitgift, has published a long letter from that eminent prelate to Beza, defending Sutcliffe against some disrespectful expressions used by the reformer. 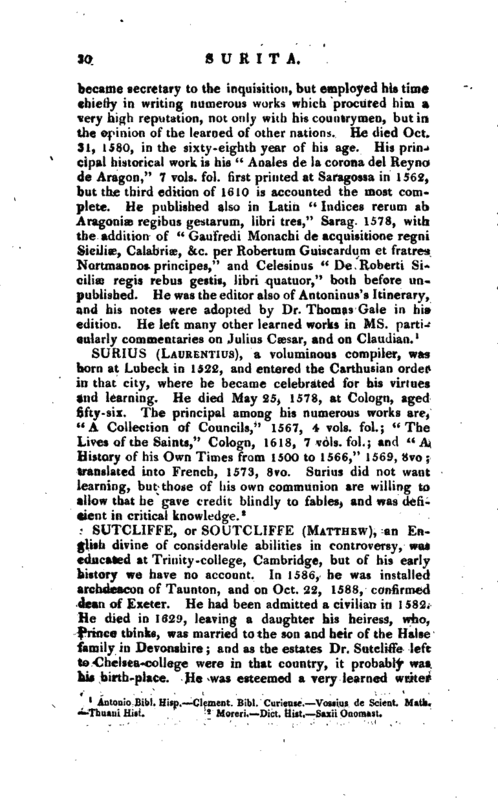 Among his works, may be noticed, 1. “A treatise of Ecclesiastical Discipline,” Loud. 1591, 4to. 2. “De Presbyterio, ejusque nova in Ecclesia Christiana Politeia,” the same year, 4to. 3. “De Turco-Papismo,” or, on the resemblance between Mahometanism and Popery, London, 1599, 4to. 4. “De Purgatorio, adversus Bellarminum,” the same year, 4to. 5. “De vera Christi Ecclesia,” 1600, 4to. 6. “De Missa, adversus Bellarminurn,” 1603, 4to. 7. “The Laws of Armes,” 1593, 4to. 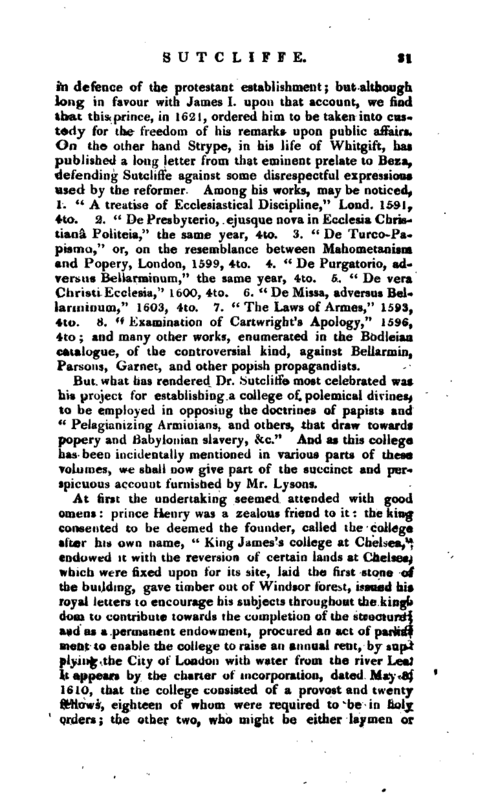 8. lt Examination of Cartwright’s Apology," 1596, 4to; and many other works, enumerated in the Bodleian catalogue, of the controversial kind, against Beliarmin, Parsons, Garnet, and other popish propagandists. 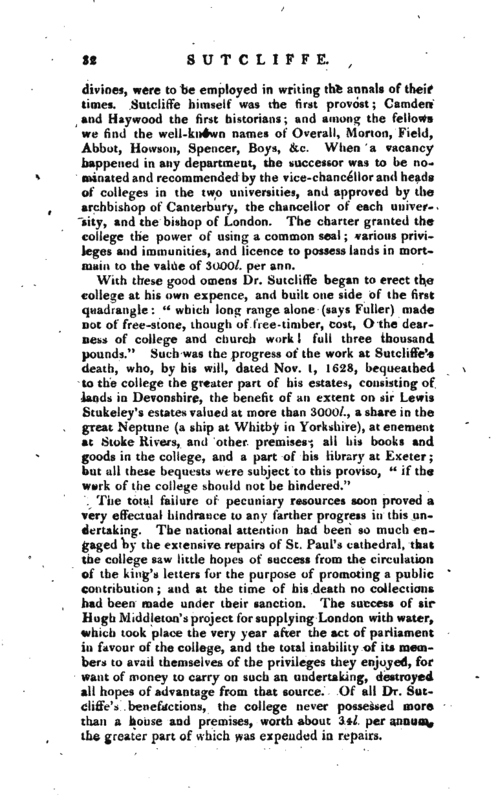 But what has rendered Dr. Sutcliffe most celebrated was his project for establishing a college of polemical divines, to be employed in opposing the doctrines of papists and “Pelagianizing Arminians, and others, that draw towards popery and Babylonian slavery, &c.” And as this college has been incidentally mentioned in various parts of these volumes, we shall now give part of the succinct and perspicuous account furnished by Mr. Lysons. At first the undertaking seemed attended with good omens: prince Henry was a zealous friend to it: the king consented to be deemed the founder, called the college after his own name, “King James’s college at Chelsea,” endowed it with the reversion of certain lands at Chelsea, which were fixed upon for its site, laid the first stone of the building, gave timber out of Windsor forest, issued his royal letters to encourage his subjects throughout the kingdom to contribute towards the completion of the structure; and as a permanent endowment, procured an act of parliament to enable the college to raise an annual rent, by supplying the City of London with water from the river Lea. It appears by the charter of incorporation, dated May 8, 1610, that the college consisted of a provost and twenty fellows, eighteen of whom were required to be in holy orders; the other two, who might be either laymen or | divines, were to be employed in writing the annals of their times. 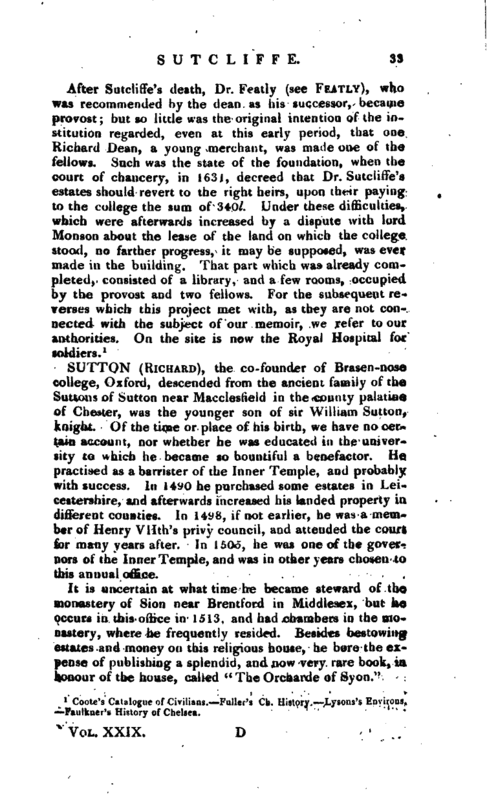 Sutcliffe himself was the first provost; Camden and Haywood the first historians; and among the fellows we find the well-known names of Overall, Morton, Field, Ahbot, Howson, Spencer, Boys, &c. When a vacancy happened in any department, the successor was to he nominated and recommended by the vice-chancellor and heads of colleges in the two universities, and approved by the archbishop of Canterbury, the chancellor or' each university, and the bishop of London. The charter granted th college the power of using a common seal; various privileges and immunities, and licence to possess lands in mortmain to the value of 3000l. per ann. 1 Coote’s Catalogue of Civilians. Fuller’s Ch. History. Lysons’s Environs, Faulknei’s History of Chelsea.